I’ve mentioned before my complex relationship with my hair. It has only been within the last several years that I have really developed an understanding and positive relationship with it. 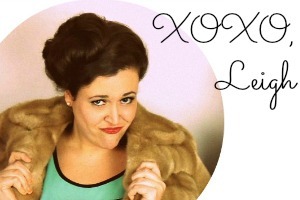 I attribute my hair-acceptance to three things: the internet, flat-iron advancement, and a love of vintage hairstyles. Although I certainly have favorite aesthetic eras, every bygone period has had stylistic movements that I think are applicable either to present day trends or that resonate with your individual style preferences. During a period where I was teaching myself how to create finger-waves and pin curls (2006-2009), I uncomfortably slept many a wet-headed night with my hair bound and structured by varied pins, clamps, and curlers. All the research suggested that curls/styles pinned from a wet-set and air dried lasted the longest. Since this method was the only way to truly achieve these styles, quality sleep was hindered once again by curiosity/vanity. I would awaken and uncurl each curl like a present on Christmas morning. They were always merph-ed or malformed… you know… because I had slept on them. No matter how I padded, or slept with my neck kinked, I could not get the results I wanted from this method. Trying it during the day yielded some nostalgic scarf wearing, middling results, and took forever. I remember thinking during this period, that, “if only I had an ole-timey air bonnet, my hair problems would be solved.” I researched modern stand-alone units and even found some vintage options… but all of them either took up premium space, which I didn’t have, or were too cost prohibitive when balanced against the potential passing whim-nature of hobbies. In the end, I rarely attempted the styles through that method again, because the time invested was just too precious. No longer. Problem solved. Flash to December 2014, with Josh and I waiting to be seated outside one of our favorite restaurants in Studio City– Jinya Ramen. Since almost all of the greatest restaurants in Los Angeles can be found in a strip mall, to fill the 20-minute wait time, I ducked into the Sally’s Beauty Supply next door. Scoping out the wares, I spied the Gold N’ Hot Hair Bonnet on the bottom shelf of the ‘Sale’ section. I remembered my long-ago wish for an affordable/efficient/collapsible solution. At $8, the price of admission for the experiment was right, so it came home with me– after delicious Ramen, of course. 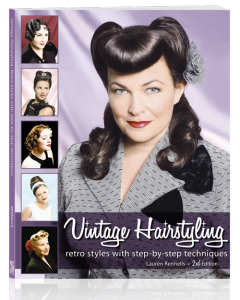 I pulled my dog-eared copy of the gold-standard tome Vintage Hairstyling: Retro Styles with Step-by-Step Techniques by Lauren Rennells. 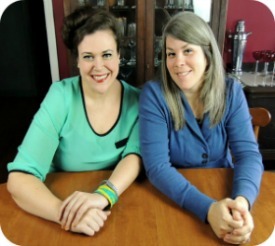 If you are a vintage hair enthusiast, then you probably already know all of this, but for those interested in vintage-hair styling her book and blog are pretty flawless. For my experiment, after washing my hair, I chose a basic, 40’s-style, peek-a-boo bang pin-curl pattern and got to work. Whether you are using a curling iron, hot-rollers, blow-dryer, or magic, if you want uniformed curls, you are going to spend SOME time prepping each curl. 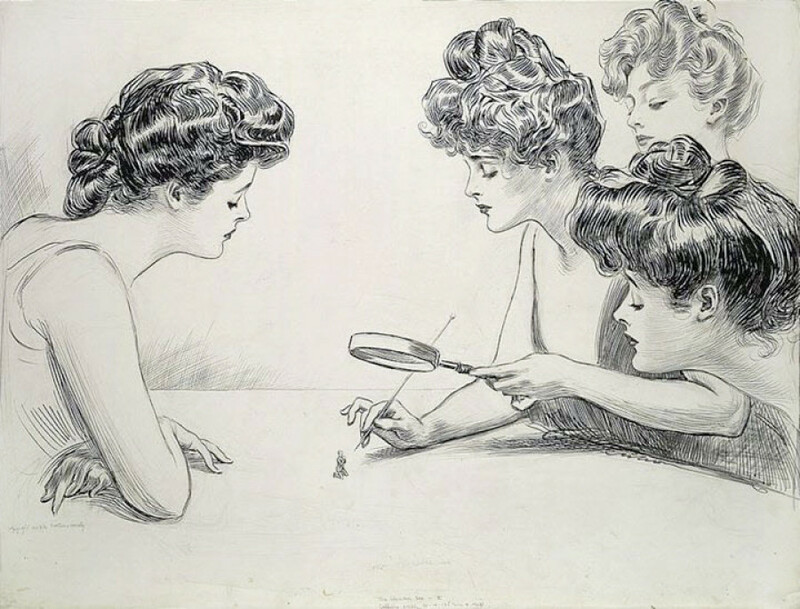 Pin curling, once you get the hang of it, is just like those other methods. As I have an unreasonable amount of hair, any kind of styling takes me longer, just from the sheer density. Once I got my hair prepped and pinned (20 minutes), I slid the Gold N Hot Bonnet over my head with the elephant trunk end going over my hair dryer. 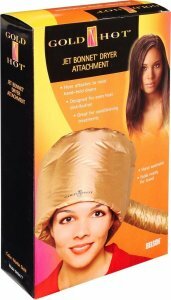 It quickly inflated warmly around my head, sounding like a wind tunnel and reminding me of younger times spent under many a chair of the finest hair-stylists in Franklin County. Josh insisted I take a picture to document the ridiculousness. Hey! I’m also sporting a failed proto-type, for this t-shirt mod! Proving once again, never practice a t-shirt mod on a shirt you LOVE. And, if you look hard, you can peep my lamp shade cover from here! 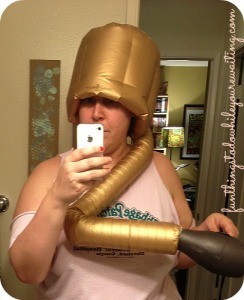 I decided to take the blow-drying time to write for the blog and prep a Fun Foto Friday segment. After 45 minutes on my blow dryers correct setting, I felt my curls to see if they were dry. I was extremely skeptical since some of my curls in the back (the hard to reach areas) were probably thicker than suggested. Surprisingly, still pinned, the curl felt dry. Though, my head was never uncomfortably hot. Having learned that the secret to any hair-curling success is to wait until the curl cools to set it, I let my hair cool down. Like a fine piece of meat, or a cake from the oven, after 10-minutes, my hair was cool enough to handle. 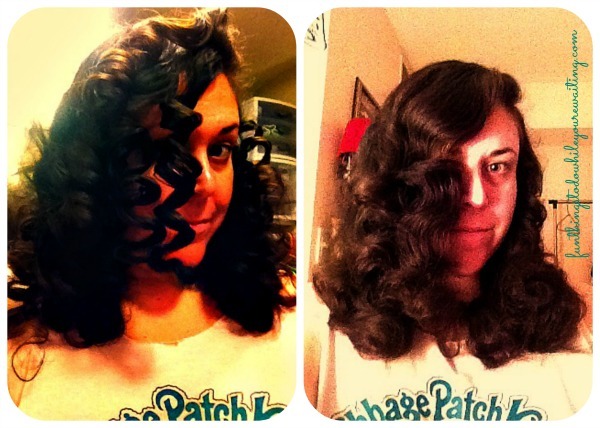 I gently removed the pins and unrolled each curl– without styling (below, left). I then styled it appropriately through careful brushing and was so tickled with my results (below, right). Apologies for the weird lighting. To continue the food analogy, this method of hair-curling is like braising: lower temperature for longer duration yields delicious results. The curls lasted for well over a week (I shower regularly, but wash hair every other week-ish) and also like braising, each day, the leftover curls kept getting better and better. In telling my mom about my curl success and my usage of an air bonnet, she revealed that she also had a hair-bonnet dryer in the sixties… proving, once again, that what once was old is new again. Are you a vintage hair enthusiast? Do you like t-shirt mods? 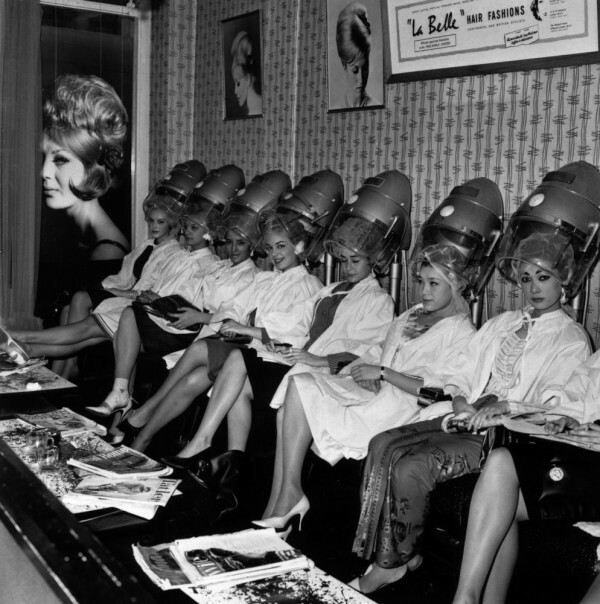 Is there a style from a bygone era that catches your fancy? As always, let us know in the comments!